Express your creative talent baking perfectly tube-shaped, cannoli or mini cannoli, celebrate the season changes and thrill your family! Show off your imagination baking the perfect tubes-shaped pastry to make your guests' heads turn to the most original dinner table decoration! Say Hello To The Last Baking Mold You Will Ever Need! Take your creative talent to a whole new level, baking in a breeze perfectly shaped, irresistible mini cannoli or cannoli treat your significant other and kids to your mouth-watering homemade sweet creations! Keep away from flimsy, cheaply-made custom mini baking pastry that stick, chip or break, making baking a torture and add convenience to your daily baking ritual! Made with convenience as top notch, this mini form foil baking pans set with the premium ANTI-STICK COATING allows for easy release of the dough, making baking of sweet temptations an instant task! Liven up your dinner party, your kid's birthday party, a Christmas, Valentine's or Thanksgiving dinner or spend constructive time baking sweet pastry with your little angels! Give them the chance to make their own little cake masterpieces and express their creativity in the sweetest way! We have you covered with the friendliest customer service and no-questions money-back policy to help you buy with confidence! LOVE our CANNOLI cake molds set or we will return your money in full! Get Your Eco Haus Living Tube Cake Baking Molds Set! SHOW OFF YOUR BAKED CREATIONS: Make your 2.75 inch Cannoli filled with whipped cream, pudding or cream conversation topic and brighten up every celebration with Eco Haus Living premium set of 10 molds. Treat yourself to an excellent DIY tool for all your baking needs to spoil your family with your delicious pastry and make your guests' heads turn at your delicious creations! APPLICATION MADE A BREEZE: Create perfectly shaped cannoli tubes, tartlets and all types of desserts with our cake baking molds! Our tin foil baking pans feature a reliable non-stick coating to ensure easy removal of your pastry and will produce in no time perfectly formed, consistent sweet treats that will thrill everybody! A MULTIPURPOSE KITCHEN AID KIT: Ideal for baking a whole range of pastry tubes or whatever else you feel like baking and with the ergonomic anti-slip rim to allow firm grip for optimal control in use, this Eco Haus Living aluminium moulds set makes a precious DIY set for all your daily meal prep or for a special dinner occasion! FAST CLEANING & CONVENIENT STORAGE: Lightweight, stackable and easy to store, these cone mold baking are a MUST-HAVE for any household! Wash them easily with soapy water and wipe them dry or toss them in the dishwasher- they will make your durable buddy for long years of baking, spicing up any celebration with their heavenly content! 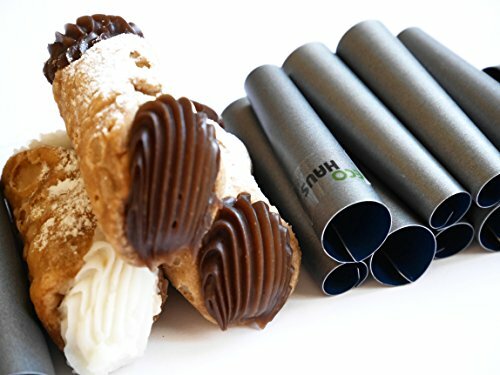 AN EXCELLENT GIFTING IDEA: Heavy-use, reliable, user-friendly and reasonably priced, Eco Haus Living cannoli molds set will make the ideal gift for any seasoned or beginner baking enthusiast! Offer it to a special friend or co-worker, your mother, grandma or any baking enthusiast on their birthday, at Christmas or any other occasion and enjoy their ear-to-ear smile! If you have any questions about this product by Eco Haus Living, contact us by completing and submitting the form below. If you are looking for a specif part number, please include it with your message.